Lucky VIPs enjoyed a pre-gala wine-tasting get-together at Grassini Family Vineyards, just a few red adobe steps away from the restaurant. 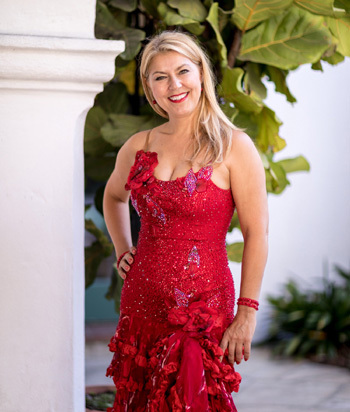 In line with the Profant Foundation’s mission of preserving Santa Barbara’s cultural heritage and assisting artists in the community through scholarships, exhibits and performances, the gala presented the Santa Barbara premiere performance of mezzo soprano Milena Kitic. Dressed in a dynamic red, embellished gown, Kitic graciously mixed with guests at the VIP lounge and later in the historic restaurant before her after-dinner performance. The celebrated Kitic, who made her Carnegie Hall debut in 1999 with the Opera Orchestra of New York, is known worldwide for her role as Carmen. Accompanied by Cheryl Lin Fielding, Kitic thrilled the crowd with selections from Carmen. 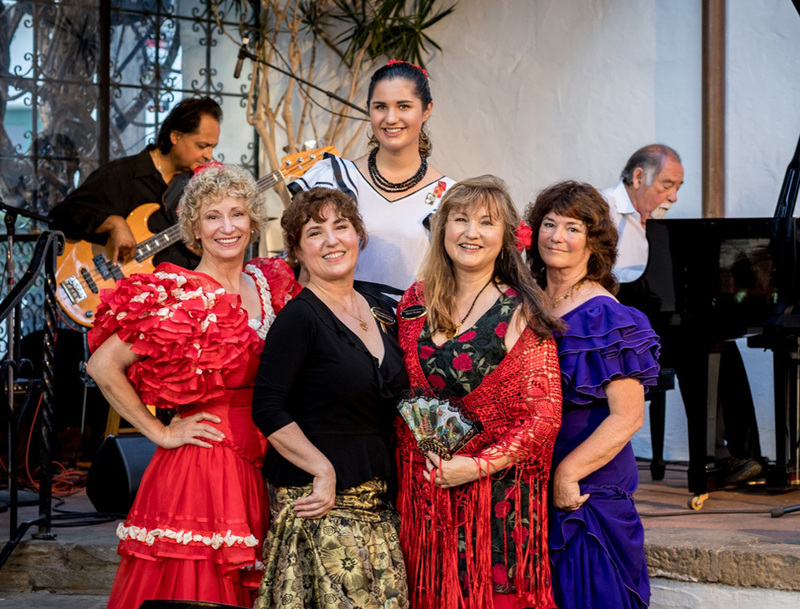 Other entertainment included Robert Cassidy, a “Painting That Comes to Life!” and performances by the amazing flamenco artistry of Ricardo Chavez and Co. and Kristen and Serge Chmelnitzki, owners of the local Arthur Murray Dance Studio. “Piano Boys” Rhyan and Zeyn Shweyk, ages 12 and 13 respectively, brought a youthful aura to the stage with their amazing keyboard talent. The Martinez brothers provided serenades during dinner and, later, dancing under the stars. Entera the Artist was there to sketch the elegantly costumed revelers during a gourmet dinner and later during dancing under the stars in the open air El Paseo Restaurant. On hand to present the Fiesta Finale were Musette, Mignonne, Marie, Michele and Malia Profant Jungart. Mignonne Profant added, “In the mid-1970s, the Profant family had the opportunity to see a young Pavarotti perform at a community college. It was such a remarkable performance that my father John (we called him Poppy) was inspired to begin singing lessons again. It was quite unusual for a full-time executive in his 40s to take up operatic training, but my mother, Lyn, always the encouraging educator, was very supportive! “His love of music was always evident. Often we'd hear him, driving up in his huge Lincoln Continental, with the radio blasting the exhilarating sounds of Placido Domingo and Poppy in full voice — pouring out through the open sunroof. Memories like that are why we celebrate his legacy with live performances of the highest quality. Now celebrating its 17th year as a nonprofit organization, the Profant Foundation has awarded hundreds of scholarships to developing artists of all ages and has sponsored exhibits and performances for arts education. Nearly 100 years ago, the Profant family began its cultural involvement in the Santa Barbara community by helping to launch CAMA, the Music Academy of the West and Old Spanish Days. The next generations created a charitable foundation in the spirit of generosity established by patriarch John Profant. Scholarships are made available through community support and proceeds from the annual gala. Noozhawk contributing writer Rochelle Rose can be reached at rrose@noozhawk.com.